The Oscarsborg fort was constructed in 1846 - 1855 to protect the Norwegian capital city of Oslo against attacks from the sea. On 9th April 1940, the fort was attacked by the Kriegsmarine and sank the German cruiser "Blücher". The remaining ships turned around and landed the German invasion forces out of range of Oscarsborg. During this retreat, the fortress managed to damage the heavy cruiser "Lützow". Oscarsborg was subjected to heavy Luftwaffe bombing later on the same day. In light of the capture of Oslo, it was decided to surrender the fort in the morning of 10th April 1940. 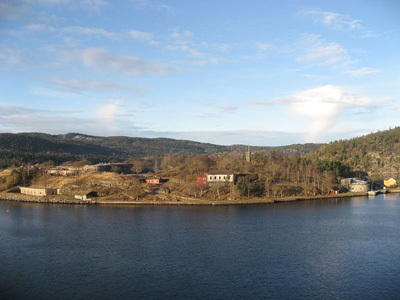 During the occupation of Norway (1940-1945) German troops were based at Oscarsborg. 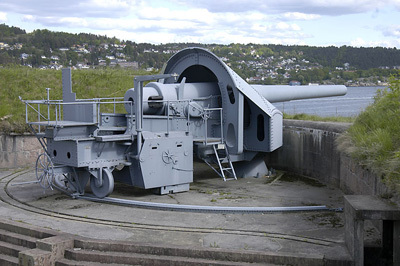 On 12 May 1945 fort Oscarsborg was returned to Norwegian control.